#FloodHack16 Follow-up - keep going! We kicked off a new month with the follow-up to our hugely successful #FloodHack16 – a chance for people to catch up and see what has been happening, plus ask new questions and offer new ideas. There was a vibrant mix, including representatives from the Environment Agency, Ordnance Survey, Highways England, and local authorities. People from local charities and community-focused organisations were also there to chat about engagement and awareness, something that can still blight larger public/private bodies. The objective of this follow up session was to share what had happened since #FloodHack16, keep the momentum going and include people and organisations who didn't get a chance to be involved first time round. 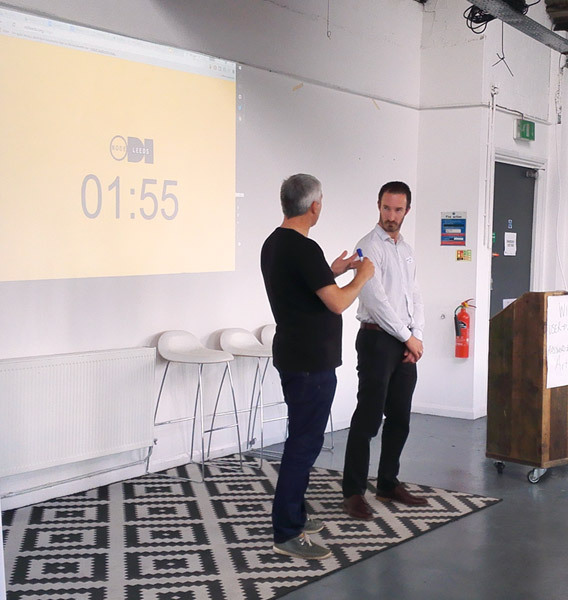 After tea and coffee to get the neurons firing, we started with some lightning talks from anybody who had something to showcase off the back of #FloodHack16 back in March. The first to take to the 'rug of truth' (our infamous dizzying geometric rug) was Mark Garford from the Environment Agency, highlighting the £350m investment for flood defences and infrastructure in the north. They already collect a lot of data (and work very hard to publish it to data.gov.uk) but were very optimistic about the use of sensors for live data reporting and warnings. 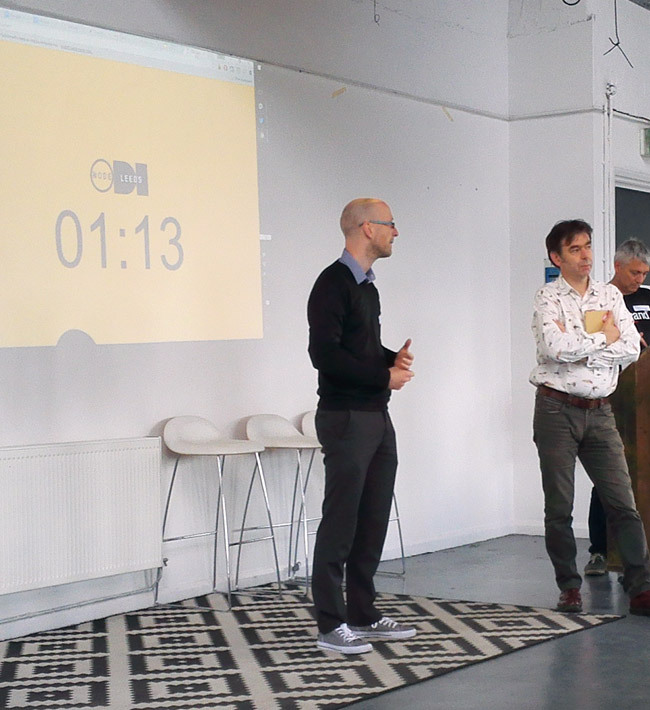 Next was our own Stuart, and Julian from Things Manchester. Since #FloodHack16, we have installed a LoraWAN at ODI Leeds and will be using it for all kinds of things related to Internet of Things. LoraWAN allows things to connect to the internet without the need for 3G/4G or WiFi, has a good range, and doesn't drain batteries in devices. Perfect for flood sensors. Next was Flotsam and Jetsam, a Leeds Inspired funded project created to get conversations started about the rivers and canals around Leeds, and gather stories from the people who were hit hardest by the floods in 2015. 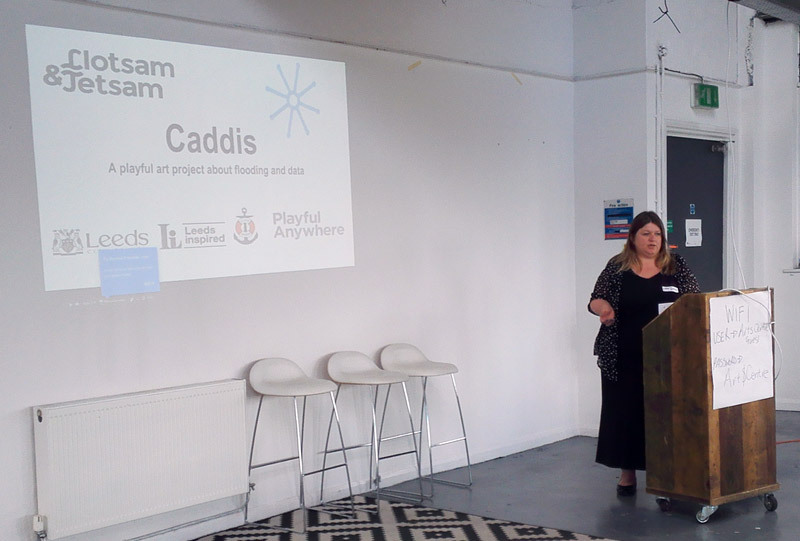 Marie Millward, the project's mastermind, was unavailable but Emma Bearman stepped in to talk about 'Caddis,' one of the canal boats used for Flotsam and Jetsam. Working with artist Gemma Latham, Caddis has been kitted out with found objects and unique artworks exploring flooding data. You can read more about Caddis here. Emma was very happy to talk to anyone who wanted to know more about using arts and participation as tools for engagement. Then it was Nick Efford's turn. A teach of computer science/engineering at University of Leeds, Nick was at #FloodHack16 in March and contributed quite a bit to the hackpad. He also collected a lot of info and data to give to one of his students for a project based on the Boxing Day floods. The student's website is still in development so it could change, or even disappear, and is a little slow in places, but is a great example of combining data to show the whole picture. The student's project took official flood data – either location-based on a map or time-based on a graph – and then pulled in tweets/photos from the same time-period. It is still very much a 'work in progress' but is worth checking out whilst it's available. 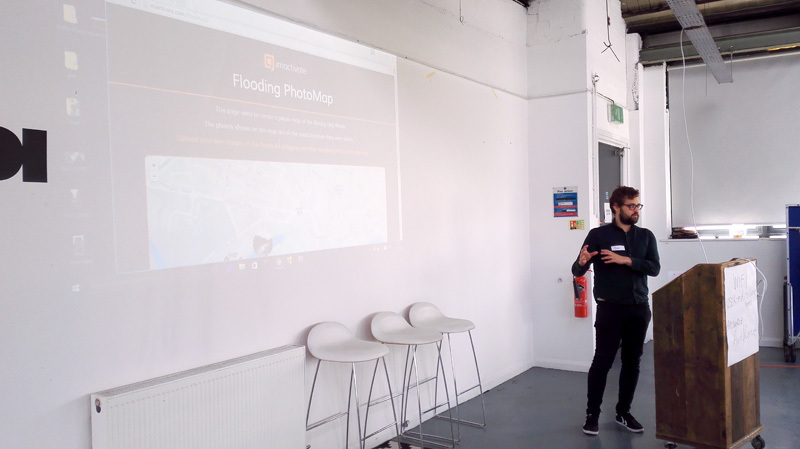 In a similar vein, Dan from Imactivate was up next to talk about the flooding photomap they developed. This allows people to drag-and-drop photos on to the map and uses the location data in the photo to place it where it was taken, creating a tableau of events and stories. That concluded the lightning talks, so we all rushed to the tea-urn for a much needed caffeine top up. The rest of the morning was devoted to making connections, asking questions of each other's projects, and working on new ideas. Clive, from Ordnance Survey, quickly whipped up a demonstration of combining their river network data with LIDAR data from the Environment Agency and information about upstream/downstream flow. Could we plan long-term defences, such as planting specific trees/plants, based on where problems were likely to occur? Could historical data also be applied to this river network/LIDAR map? After lunch, the afternoon continued with collaboration, more new questions to old problems, new problems from old questions, and much more that kept the discussion around flood prevention and reaction. Everyone gathered again for a final 'show and tell', summing up their progress and plans to go forward, and also giving people who couldn't make it in the morning to ask questions and make suggestions. Bradford & Leeds Council are considering how a pilot LoRa Things network could be deployed with 2-3 flood sensor end-points to give more data relating to river and flow in Leeds & Bradford. 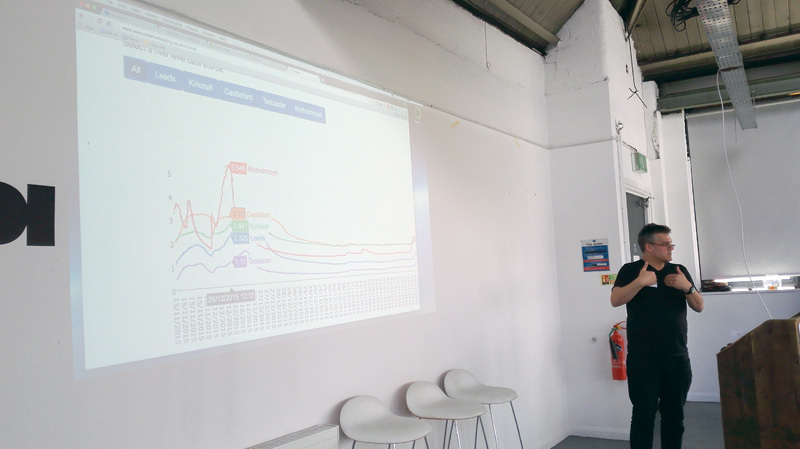 Adrian Walker from Bradford Council, who was here to find out more about what we had accomplished with #FloodHack16, thought flood sensors could also be used for engagement – showing the public how flood defences are working. An interesting idea, and potential future collaboration, came out of the Environment Agency. They wondered if it was possible to use real time camera feeds from Highways England to identify flooding hotspots as they happen and then notify road users. Combine this with their idea to map culverts (a tunnel carrying water under a road) and use rainfall data to predict where problems might occur and it sounds like a plan of action.